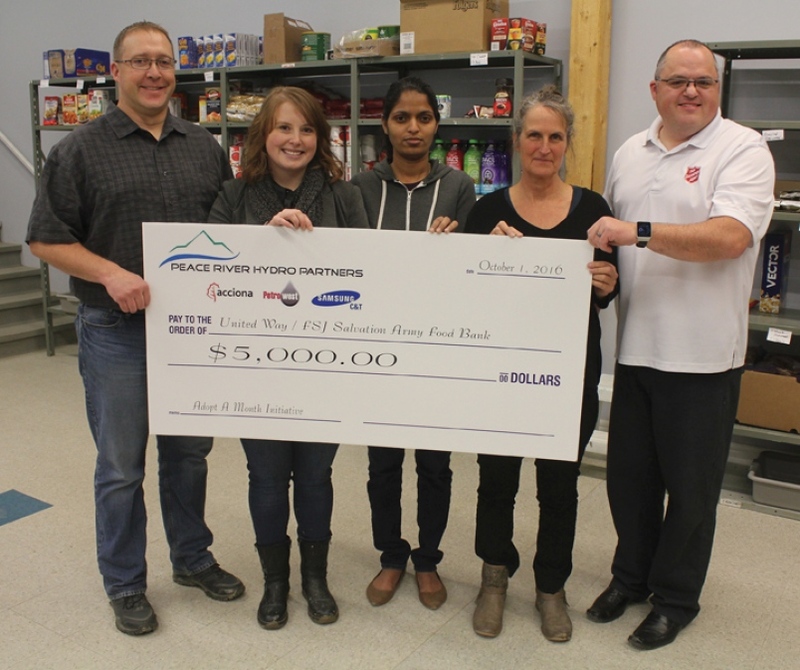 Peace River Hydro Partners has adopted the month of October as part of the United Way’s Adopt A Month initiative in support of the Salvation Army food bank. The food bank saw 1,917 people come through its doors in September, and has seen a total of 7,038 clients since June, according to United Way statistics. ​“It’s incredible how many people access the food bank so we want to give back any way that we can,” said Amber Harding, PRHP communications manager. The United Way initiative aims to raise $5,000 a month to stock the food bank with fresh produce and other perishables to supplement the non-perishable items given out. It launched in September with Shell as the first supporter. Salvation Army Capt. Sheldon Feener said the monthly donations go a long way in providing extra nutrition for those accessing the food bank. "It just makes the meal a little bit healthier, a little bit more sustainable, and helps to make you to feel a little better about it when you can cut up the fresh produce, the celery, the carrots, the bell peppers, whatever, and add it to your food," he said. The biggest needs for clients outside of produce are milk, eggs, and meat and protein, Feener said. The food bank has secured a local supplier to provide 30 dozen fresh eggs a week with the help of the United Way. And while Feener expects to see some meat donated through the hunting season, the food bank is in need of a milk supplier. "It's something that I get asked for all the time, 'do you have milk, do you have milk,' and it's not something that we do have," he said. "If someone wants to step up and say 'Hey, I can provide you with some milk,' even if it's something that's not necessarily on ongoing thing, but, you know, a one off, 'I can give you milk for a month,' I'd be thrilled." Harding said PRHP has signed on for a three-year commitment to support the Adopt A Month initiative, with donations to follow next year and in 2018. She hopes other local businesses will join in. "Absolutely there should be a company for every month of the year for this initiative," she said. "There's such an incredible need in the community and nobody should be hungry."